America likes a winner. That’s the takeaway from this map released today based on which team Facebook users were rooting for during the Super Bowl yesterday. The Broncos weren’t hurting for fans — Colts country stayed loyal to Peyton Manning, and 49ers fans must have been cheering for the team that’s not the Seahawks — but the Seahawks got the same bump from disgruntled New England fans. And check out that blue block in the upper left — that may as well be considered the official geographic definition of the Pacific Northwest. And it’s a big improvement from the map we saw before the NFC Championship game, when the Northwest fandom was up against pretty much the rest of the country. • 50 million unique users on Facebook posted, liked or commented about something related to the Super Bowl on Sunday. •More than 24.9 million Tweets were posted about the game and halftime show, beating last year’s 24.1 million Tweets. •The most-mentioned players for each team on Twitter were Percy Harvin (followed by Richard Sherman and Russell Wilson) and Peyton Manning. 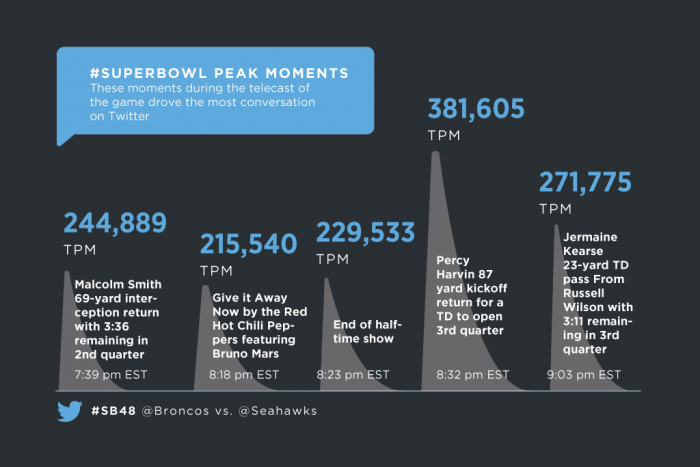 •The halftime show by Bruno Mars and the Red Hot Chili Peppers got more tweets than anything Denver did the whole game. UPDATE: Deadspin just posted the pre-Super Bowl fandom map, which makes for a great contrast. On the left is the pregame fandom map (comparable to the 49ers map above) that shows which team has the most Facebook fans in each county. 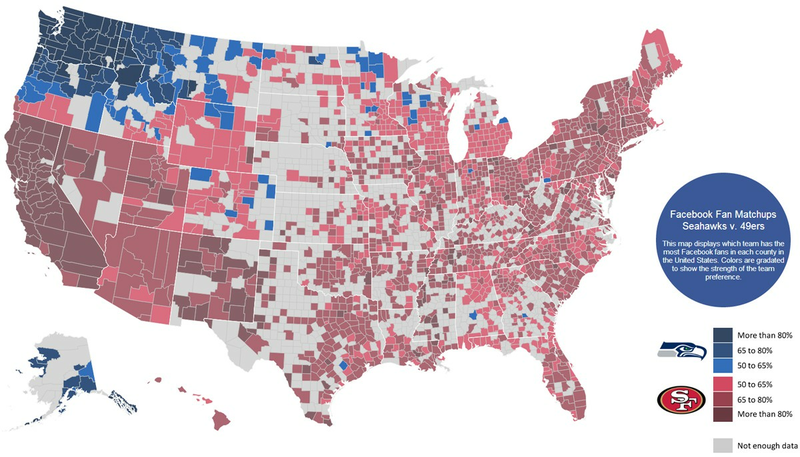 On the right is the map from during the game (same as the top map in this post), showing which team people were actively supporting. So, as the game unfolded, either people switched allegiences or Seahawks fans came out of the woodwork as their team dominated. Probably a little of both — it was a good day to be a Seahawk fan. MORNING BRIEFING: Seahawks win the Super Bowl! 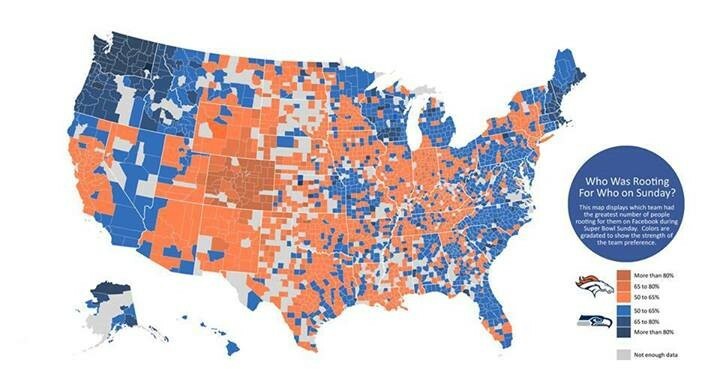 According to this map, you're probably a Mariners "fan"